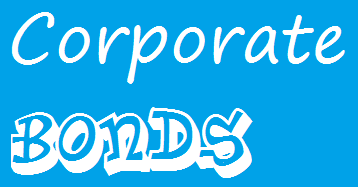 Find best performing corporate bond mutual funds 2014. Top funds are Schroder Long Duration Investment-Grade Bond, Vanguard Long-Term Corp Bond Index, etc. Corporate bond funds invest mainly in debts issued by companies. These funds typically invest in high quality bonds. As part of taxable bond fund, this corporate bond funds provide high yield for income seeker. To maximize your return, you can invest in your brokerage or retirement account such as Roth IRA, 401k plan, and traditional IRA. You should consider sheltering this bond fund in your retirement accounts. These bond funds are sorted based on its year to date performance. These bond funds may be ranked as the best funds in corporate bond category. I have provided the fund review information such as yield, management, objective, expense ratio fee, holdings, top sectors, etc. This Schroder Long Duration Investment-Grade Bond fund has just been introduced to public in October 2011. It has annual expense ratio of 0.46%. This bond fund seeks to achieve a total return that exceeds the benchmark, the Barclays U.S. Long Government/ Credit Bond Index. The mutual fund is being managed by Andrew Chorlton, Edward Jewett, Richard Rezek, Neil Sutherland and Julio Bonilla. The fund is currently traded at $9.93 as of March 4, 2014. It has 0.46% annual expense ratio. This top fund recorded a total return of -6.17 in 2013 and 16.61 in 2012. The fund’s yield is 4.60%. The most recent distribution was in February 2014 with $0.04. 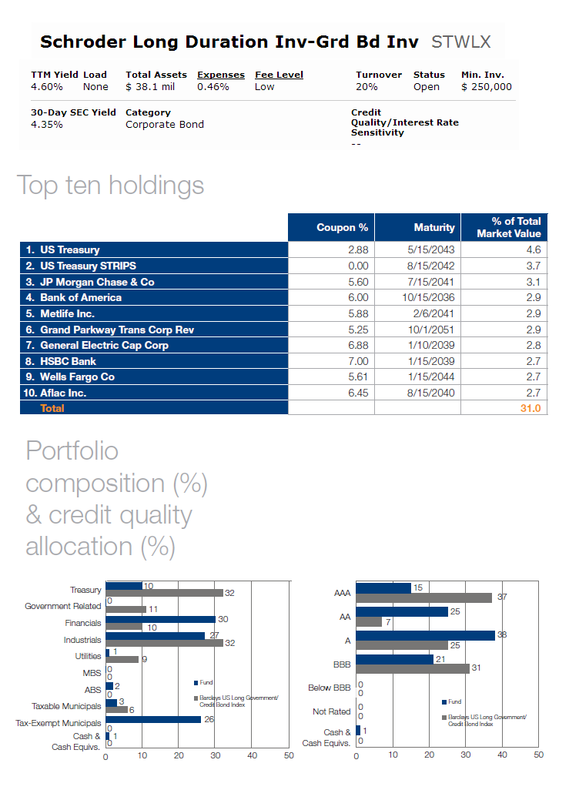 The top holdings as of December 2013 are US Treasury (4.6%), US Treasury STRIPS (3.7%) and JP Morgan Chase & Co (3.1%). Morningstar analysts rank this Vanguard Long-Term Corp Bond Index Fund (VLTCX) with 4-stars rating for its performance. The total net assets are $957.2 million. It has 0.12% annual expense ratio and 4.64% dividend yield. This top performing corporate bond mutual fund returned 15.90% in 2011, 12.29% in 2012 and -5.92% in 2013. The current YTD return is 5.44%. This fund is on the first rank among its peers in the category. It uses Barclays US 10+ Year Corporate Index as the benchmark. It also has 23.9 years of average maturity and 13.4 years of average duration. This Vanguard Fund is available for purchase from 19 brokerages. 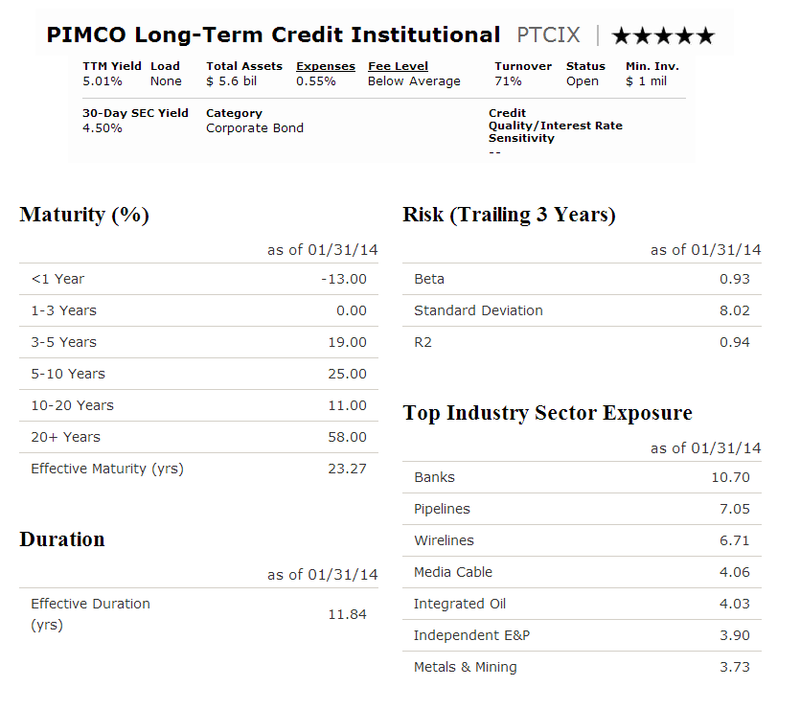 This PIMCO PTCIX fund was introduced to public in March 2009. The CUSIP of this fund is 72201P647. It has $5.6 billion of total net assets. The fund distributes 5.01% dividend yield and it is distributed on monthly basis. The YTD return is 5.27%. The fund has 3-year annualized return of 11.06% and 1-year annualized return of 0.25%. It has the highest rating from Morningstar (5-stars). The fund is also available in Class P (PLCPX). The top industry sector exposure as of January 2014 is Banks (10.7%) and Pipelines (7.05%).